Still quite behind.........plugging along though. I couldn't post yesterday because my net package finished at some point in the morning (75 GB allowance finished in 20 days from a possible 30). I didn't have any money to renew my package but did manage to convince the vendor to allow me a day's grace to pay him. Despite that, my net package could not be re-activated till about 10am this morning. This was preceded by an evening of frustration. It transpired that the vendor could not process the transaction in time and.....did so first thing in the morning. He has still given me a day's grace. I have to pay him tomorrow. Welcome to the Full Page Screen Capture extension. You can run this on any webpage, except for ones where the browser restricts extensions from running scripts. This includes the Chrome web store, browser settings pages, and other extensions. Chrome does not allow access to some URLs for security reasons. This includes the webstore gallery, other chrome extensions, and chrome:// URLs. The current page appears to be a restricted URL. "I think long gone are the days when somebody could speak for someone else, without the latter's consent. Try and refrain from throwing the human beings of AJK and GB under a bus and pretend to be speaking on their behalf, while clearly subduing freedom of expression in both territories, deliberately kept apart by your State. Instead, concentrate on developing your image as a responsible nation, with a hands-off approach to conflict resolution in your vicinity. The less you're involved and more you cede to the citizens of AJK and GB, the better your image will become. That's when you'll genuinely prosper. The world is moving along at astonishing speeds. They are not going to wait for you to catch up. Identify your opportunity cost and optimal trade-off. You can't have everything. No one can." Topical Questions Oral Answers to Questions — Foreign and Commonwealth Office – in the House of Commons at 12:00 am on 30th October 2018. I draw the House’s attention to my entry in the Register of Members’ Financial Interests. For over 70 years, the sons and daughters of Kashmir have been subjected to persecution, oppression and human rights abuses, yet it seems that our position continues to be that this is a matter for India and Pakistan. How many more innocent men, women and children have to die before we at least facilitate peaceful talks between those countries to find a peaceful resolution? I do understand the passion and the genuine sense of outrage that the hon. Gentleman feels. Ultimately, there can be a solution only if India and Pakistan work together. It cannot be our role to intervene, not least because, as I think the hon. Gentleman will understand, we will be seen by one or other side as intervening on that side rather than on the other. We will do our very best, as I have already mentioned, as far as the UN is concerned—given that a UN report is on the table—to try to bring the parties together. However, on the notion that it is in any way the place of the UK Government to intervene on this matter, I am afraid that we have quite rightly maintained such a position for over 70 years. The last sentence of Mark Field's response is most telling. How convenient to abdicate from your responsibilities I say. Who drafted the Indian Independence Act in 1947 and whose responsibility was/is it to bring it to fruition? The issue that transpired as the 'Kashmir Dispute' has its roots in matters deliberately overlooked. I had to embed this extremely touching and emotional message - in Poonchi Pahaari - from a brave young lady living in Indian controlled Jammu & Kashmir, whose paternal grandfather had to flee for his life from Palandri (in what became AJK). Listen to her tearful plea to both India and Pakistan: to stop dividing the people of this territory on the basis of religion. "Let the humanity in us thrive", is her constant cry. I understand that her name is Romi Sharma - an actress/poet - whose family resides in Jammu. 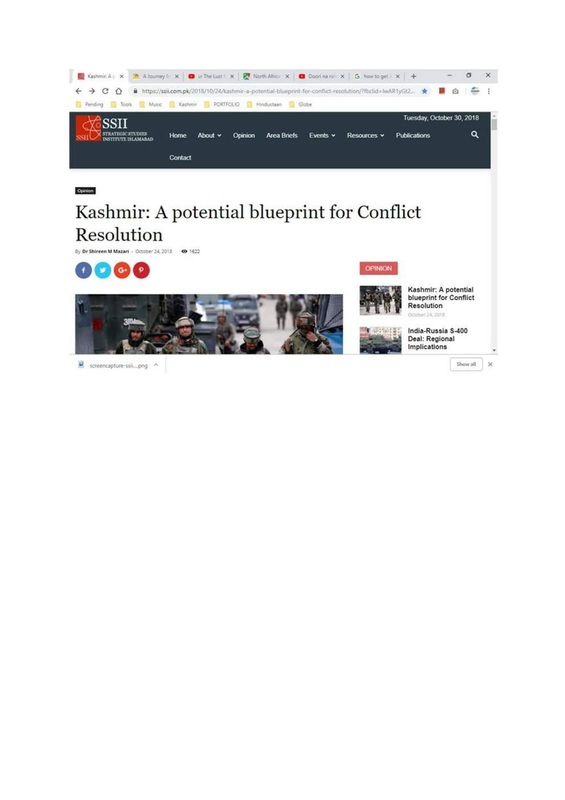 Investigating Shujaat Bukhari's Murder.....re-visiting the 14th of June......The UN Report on Jammu & Kashmir.......Chinese posture since, Indian posture since and Pakistani posture since. I'm currently assessing Dr Shireen Mazari's article and speech. We all need to be as honest as possible and she has made an effort - has read a lot - but is misleading or misinformed on many fronts. I really liked this tweet for its illustrative effect. It accurately depicts India's tactics to stall any form of meaningful dialogue on Kashmir. Now, I've said this many times before and will say it again, that the road to dialogue and cessation of the murder and mayhem that takes place in the Kashmir Valley begins with Pakistani military withdrawal from AJK. India's wrongs do not make Pakistan right. It is quite correct for citizens of the Kashmir Valley living under Indian occupation to describe today as a black day but Pakistan's gradual dis-honouring of the Standstill Agreement with the Maharajah of Jammu & Kashmir, followed by a full-fledged tribal attack on the State on the 22nd of October, which paved the way for India's entry doesn't make Pakistan's role 'white' in any way. The area of Trarkhel – now a subdivision (tehsil) of district Sudhnoti – inadvertently became famous post 1947 for ‘Radio Trarkhel’, ostensibly created to counter Indian propaganda on Jammu & Kashmir. However, this radio station was never situated in Trarkhel and the locals here had next to no agency in its formation or broadcasting output. It was actually broadcast from Rawat in Pakistani Punjab and had much more to do with Pakistani propaganda on Jammu & Kashmir than reflecting the thoughts, issues and aspirations of a people stuck in a conflict between 2 powerful neighbours. An interesting event of public activism for basic necessities such as: a hospital, roads, university campus, distinct electoral constituency status and water supply schemes amongst other basic demands took place on the 18th of September. 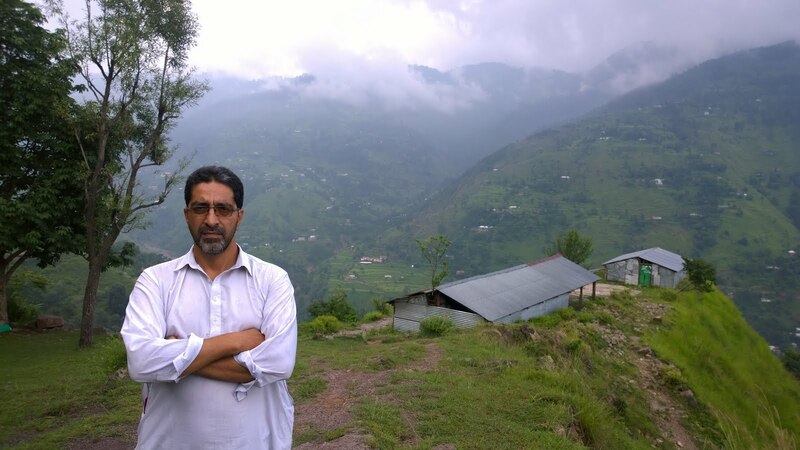 This writer was invited by the locals to come and cover the event but due to his engagement in completing the academic version of the ‘AJK Public Opinion Survey Report’, he could not do so. He did intend to write up on it soon after it happened but again, engagement in other matters of public interest and an illness prevented him from giving the necessary attention to this task. Better late than never is a motto useful to adopt in a territory such as AJK. On the 18th of September the local public staged a sit-in in the city, after a call to strike by the local ‘Public Action Committee’. Many members of the public from adjacent towns and villages vigorously participated. The whole city was jammed and all roads running throughout the tehsil were completely blocked for all kinds of traffic. Life in Trarkhel came to a standstill. The strike had begun early in the morning from 7 am, whereby many members of the public converged on the city from surrounding areas and marched towards the centre of the city. There, a series of speeches to brief the public in reference to the protest strike took shape. Throughout the day, not a single representative of the AJK government came to enquire or offer any measure of appeasement. 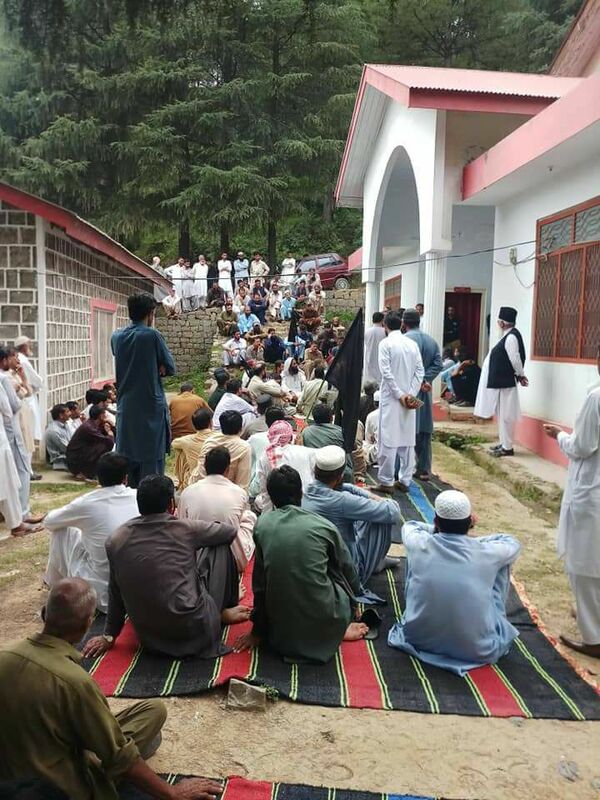 It wasn’t until 11pm that the divisional commissioner of Poonch arrived to enquire as to why the public had staged a sit-in en masse - all day and into the night - without any sign of retiring. A dialogue then ensued between the leading protagonists of the strike call and the commissioner. The latter asked the people for twenty days to work on these nine public interest demands. After consultation, it was mutually agreed that the strike would be postponed till the 10th of October. If there was no progress in the interim, then the public would resume their blockade of the subdivision following that date onwards. Indeed, as is the norm in AJK, none of the demands were fulfilled by the deadline of the 10th of October. There was a by-election looming on the horizon scheduled for the 21st of October. On that very deadline day, the prime minister of AJK: Raja Farooq Haider visited Trarkhel and apart from campaigning for his party’s candidate, also met the leadership of the ‘Public Action Committee’. The latter reiterated their nine demands in public interest. Furthermore, that if they were not fulfilled the public would create hurdles in the upcoming poll. The prime minister of AJK responded angrily to this threat by threatening in turn to, use all force at his disposal to ensure any hurdles from the public did not materialise. In this ferocious interchange of words, representatives of the ‘Public Action Committee’ made the point that the government can’t deliver basic needs to the people they collect taxes from but can go to any expense to enforce an oft-repeated election exercise, that hasn’t delivered in 71 years. Subsequently, communication broke down between the prime minister and the local activists. What followed was a prolonged dialogue between them (the activists) and Dr Najeeb Naqi. Who not only happens to be AJK minister for health, finance and P & D (Planning and Development) but is the MLA (Member of the AJK Legislative Assembly) for the adjoining constituency in Palandri. 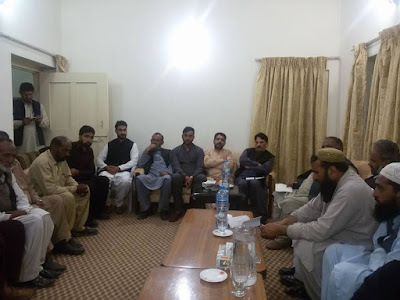 It emerged that Dr. Naqi was eventually successful in convincing the activists that all their demands would be fulfilled after the by-election on the 21st of October. The ruling party (PML-N) won the battle of attrition between them and the ‘Public Action Committee’ of Trarkhel. Their candidate also won the by-election. The status of the nine demands in public interest, remain exactly where they were before the agitation began a few months ago. This activity follows a distinct pattern – indeed a tradition - of how public interest activism ultimately intersects with state repression, where the latter usually wins and the public – at large – lose out. Where the sincere energy and resources of those who want to improve the quality of governance in their region is always abused and utilised by various ‘actors’ in the public domain. In the context of AJK, it almost always seems that both parties on either side of the negotiating table viz. the activists and the government are ill-equipped to take measures to improve the governance of AJK. Both actors are dwarfed or limited by the needs of Pakistan. The latter wants to minimise the amount of development funds it gives to AJK in order to maximise the return on its investment to extract resources from this territory. People who can successfully agitate for their basic rights will in due course logically agitate for their sovereignty. The people would then no longer tolerate a relationship which is purely extractive on the part of Pakistan, which is operating in this region without due legal procedure, courtesy of a very convenient alibi (we’re in conflict with India). In such a scenario it would remain convenient for the local rulers (proxies as some may suggest) to not upset the status quo. Our local politicians will continue to placate their co-citizens in a far more efficient manner than the ‘occupier’ ever could. Many thanks to Engineer Syed Faisal Gillani, for his crucial input into this piece of public interest information. It's always beautiful when one is in a working groove. One should count their blessings, if possible. I want to pursue the 'Lord Nazir at Kashmir Conference in Ireland' because even in the digital age: propaganda is everything. Dear co-citizens of AJK: We have been taught that our forefathers rebelled against a cruel King and attained freedom on this day 71 years ago. Some say that we brought down an individual and gradually ushered in 3 neighbouring armies. Did we jump from the frying pan into the fire? Is it time to re-evaluate the basis of our existence? Can we make a fresh start? 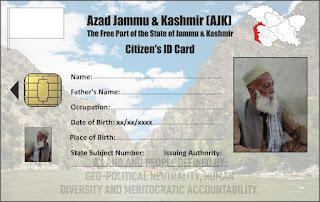 The public enemy policies of the authorities in Azad Kashmir and Pakistan have forced me to take this step to migrate from Azad Kashmir and Pakistan in the direction of..............towards an unknown destination where I can hide my head. Water, diesel, petrol, gas, coal, paraffin oil, atomic power, solar power, dry battery, seawaves, garbage and even without wind, if necessary. Khyber Pakhtunkhwa, Sindh, Punjab, Baluchistan, Gilgit, Kashmir and in particular Tharpaakar (Sindh) are where the public are deprived of a morsel of food, justice, education and healthcare. Why? Where there is load-shedding (of power supply) and expensive electricity. Where there is expensive education with a dishevelled curriculum and educational institutions without roofs, protective four walls or toilets. Where there is unclean common drinking water sources that lead to hepatitis and HIV aids. Where there is a cruel termite-infested banking system. Where in practice, there is a different set of laws for the rich and poor. Where zakat (compulsory alms-giving) and its institutional structure 'Bait ul Maal' (House of Wealth) including schemes such as Benazir Income Support Programme and Health Card, are all a cruel joke at the expense of the poor. Where young children and women are victims of violent sexual assault. Where freedom of expression is prohibited. Where the United Nations Charter and the constitution of Pakistan are abandoned. Where farmers, physical labour and creative writers are economically strangulated. Where the children of those in power are facilitated with permanent occupations (job positions) while the children of the poor are subject to ad-hoc-ism and employment on contract. These are the enemies of Socrates (5th century BC Greek philosopher). Note: anything in brackets in the translation above is my emphasis to make the text easier to understand. It does take time to re-invent one's daily schedule, after many months and in some aspects many years of following a particular routine. I actually wrote most of the following post the day before yesterday. Such is my lifestyle that if I'm ever out in the field (in public) to cover or attend some event in public interest, then heavy engagement with others combined with travel through urban dust, makes it difficult to maintain that daily momentum of a diarist. The basis of identity or the concept of an 'ID Card' as a measurement tool for governance and aggregator of public interest.....is the theme of an article revving up. Meanwhile, the Pakistanis seem to be doing everything to disgust public opinion in AJK and GB. Fayaz ul Hasan Chohan is a name that will not go amiss for a while. He has a tendency to pick up speed in speech and not know when to brake and who or what he has hit on impact. Fayaz ul Hasan Chohan is the provincial minister of Punjab for information and culture in the PTI government. He lists as number 6 of his areas of interest on his twitter account as: "Establishing a tolerant society". The AJK PM's status is so insignificant that even a low-ranking (Pakistani) military intelligence operative could dismiss him - as the prime minister of AJK - by simply dragging him out with his ears. Furthermore, that Raja Farooq Haider was a barking dog who had betrayed his masters that fed him and gave him honour. That was in the wake of the AJK PM's joint press conference in Islamabad with Hafiz Hafeezur Rehman - chief minister of GB - in response to the Pakistani Supreme Court's decision to disqualify their party leader Nawaz Sharif from the premiership of Pakistan in July 2017. Raja Farooq Haider had said that - and I'll directly translate his words - "if Imran Khan is the embodiment of Iqbal's Pakistan, then as a Kashmiri, I would have to ponder over what kind of country I'm aligning (acceding) my destiny to". 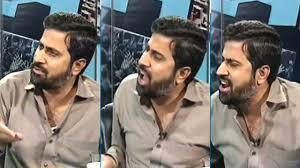 Mr. F u H Chohan went viral then and is going viral once again today (20/10/18) by repeatedly using the term 'Kashmiri' in a disparaging way. Returning to today, Mr. F u H Chohan is still making waves on social media, despite an apology of hurting the sentiments of 'Kashmiris'. Still working on this thread as I think it may allow us to understand the 'war of narratives' in a much clearer way, ultimately. Water, water and water management knowledge applied to technology could help Jammu and Kashmir provide the soundest argument to halt the expansionism of China, India and Pakistan. All 3 countries rank low in water management performance. We are consuming way too much information on a daily basis. There is so much expertise and wisdom out there but there is so much more that isn't and needs to be created. How can you process a lot of opinion on a particular subject and translate that into public policy in a region such as AJK? Early starts are always good for one's health. Even at the grand old age of 46, it's never too late to develop a good habit. I was asked by the person mentioned (at the beginning) of the following letter to send him an article on Mahmood Ahmed Musafir earlier last month. However, he was unable to present it as apparently - though somewhat belatedly - he felt that Mahmood Sb. needed to be a member of a political party to get his voice heard. I would argue that in the context of AJK, we don't exist as a recognised territory anywhere and thus any aspiring collective force in our territory also suffers from the same limitations. As our problem is a collective one and as all - or even the majority - of our people are highly unlikely to mobilise around a single party-based political force, it is more pragmatic if we recognise the individual contributions of each other, while galvanising ourselves as citizens of a territory; whose progress depends on us being recognised by the rest of the world. As a 'nation' in our own right and not as an inconsequential flock lurking on the fringes of the 'Kashmir Conflict'. If we can't productively engage with each other as opposed to infrequently talking 'at' each other, there is little point in us engaging with the world and trying to convince them of our plight. This report will follow a chronological path – as described by Mahmood himself to Tanveer Ahmed in Pahaari a couple of days ago - highlighting the major acts in public interest conducted by Mahmood Ahmed (Musafir is an alias meaning traveller in Pahaari and Urdu) and it will aim to be as concise as possible, with a summary by Tanveer Ahmed followed by links for further reading given at the end of the report. This may seem long but it is merely an outline of the work and struggle of Mahmood Ahmed Musafir. Even in the links section, there is much content which has yet to come online. In 1965, when I was aged 1 year and 2 months my parents fled from Indian-controlled areas along with me and all my siblings when war broke out between India and Pakistan. They came and settled on the outskirts of Kotli city. In 1970, aged 6 and before going to school I began challenging conventional knowledge and wisdom. For example, was the globe really oval-shaped? At the beginning of 1971, our family shifted to Kotli city. On our arduous journey we reached a place called Dhandwaar near – what is now - Thaler Bridge in the late hours. A thought struck me that I wish there was a road here for people to travel on. Note: We will return to this area in 2014. In the same year, I was admitted to Mandi primary school in Kotli. On the 31st of March 1972, results for the second standard were published. I approached the school presuming that I would either come first or second in my class. However, I was informed that I had failed. My namesake who deserved to fail had been declared successful (passed). This wasn’t deliberate but rather an accident. This event became the reason for me to launch my first public protest at the age of 7. I didn’t consult with anybody and went by impulse. My grievance was addressed and I was admitted to the 3rd standard. I then continued my education till class 8 (8th standard). In my first semester at this standard, I had received 96 out of 100 in Mathmatics. In my second semester I received 98 out of 100 in the same subject and in my 3rd & final semester I received 100 out of 100. A few years later, on the 11th of February 1984 a criminal case - including charges of banditry and rebellion against the State - was registered against me for protesting the hanging of the Jammu & Kashmir freedom icon Maqbool Bhat in Delhi (India). I was arrested on the 26th of February – 15 days later – and the local police thrashed me mercilessly. As a result of this violence, I could not sleep on my back for 2 months and had to rely on resting on my stomach at night. Meanwhile, while in police custody I conducted the first hunger strike of my ‘career’. On the 10th of March, the local police released me and ten others by completing judicial obligations themselves using fictitious names. All 11 detainees had been detained to present an ‘air of efficiency’ on the part of the police, for all the looting and rioting that took place on the 11th of February. Not even one of the actual culprits had as much as been questioned. 11 sacrificial lambs had been put to the slaughter in a sense. I was just one of them. In 1993, in light of the excessive load-shedding of electricity in AJK, I began thinking about how we could generate electricity using thermal means, which to this day I think is relatively cheaper than other means. Many people in both AJK and Pakistan consider this method expensive but have been unable to provide evidence to date. Remaining in 1993, when I was working as an un-salaried driver to an MLA (Member of AJK’s Legislative Assembly) Choudhary Yasin and while sitting in the AJK Assembly Hostel, I noticed an appeal in a newspaper made by Sardar Riaz Ahmed Khan (Secretary – Department of Agriculture and Animal Husbandry). This appeal read that to fulfill the meat and dairy needs of the AJK public, goat and fish farms need to be established to balance demand and supply. I liked this idea. The AJK Government had publicly pledged to provide an interest-free loan of up to 5 lakh (500,000) PK rupees for such an investment. Having invested 7.5 lakh (750,000) PK rupees of my own money, I now needed a further 7.5 lakh to complete my investment in a dairy farm. When I contacted the AJK government, they directed me to approach any bank whilst assuring me that upon the given bank accepting my loan application, they would agree to pay the interest demanded. This was their first false pledge. I began visiting various banks and the uniform response I kept getting was that I was a ‘muhajir’ (refugee) and that my land was either in Indian-administered Kashmir or in Pakistan. “We can’t give you a bank loan in Kotli”, they reasoned. Two years elapsed in this particular struggle. In a state of despair, on the 5th of March 1995 while I was contemplating suicide, a friend informed me that the head of AJK’s Accountability Bureau was holding an open court in Kotli and suggested that I put forward my case there. Upon doing so, I re-iterated my request for a loan from any financial institution. Further, that I was also willing to offer an alternative for collateral. However, if I was to be constantly refused on account of - being brought as an infant from an Indian-controlled area of Jammu & Kashmir to seek refuge in a Pakistani-controlled area of Jammu & Kashmir – then I logically suggest that I be granted a special licence to steal and swindle or sell drugs and alcohol etc. In light of the above and the application given, I was finally offered a loan on the 31st of October that year. The AJK Government’s Co-Operative Bank released a certificate of acceptance for a loan of 7.5 lakh (750,000) PK rupees. However, as I refused to provide a bribe to the concerned intermediaries, the loan was not forwarded to me. In reaction, on the 20th of April 1996 I decided to stage a hunger strike outside the President’s House in the capital of AJK – Muzaffarabad. I was duly arrested and presented before senior sub-judge Bashir Mughal, who sent me to jail. The charge against me was ’13 Act’ and the sheet made reference to me as a ‘paagal’ (madman) who is capable of doing anything. 1) That I would have to prove ownership of 1 kanaal (an eighth of an acre) of agricultural land. 2) As an additional guarantee I would have to put up my family home as collateral. I fulfilled these conditions but the AJK Government could not fulfill their promise. This prompted me to conduct a walk from Kotli to Muzaffarabad via Rawalpindi (in Pakistan) between the 9th and the 19th of September in the same year (1996). This resulted in me being ‘expelled’ from AJK 3 times. Once to Abbotabad in what is now KPK province in Pakistan, on another occasion to Mansehra, which is also in the KPK province of Pakistan and once the AJK police forcefully dropped me in Rawalpindi, again in Pakistan. What followed was a meeting at the Regency Hotel in Pakistan’s capital Islamabad on the 4th of November. A conference of the board of directors of the Co-Operative Bank was taking place where my peculiar case was discussed. However, the working paper put up by the secretary (of the board of directors) included incorrect information, due to which only just over half the loan viz. 4 lakh (400,000) PK rupees was sanctioned. Our parental home was valued at 7.5 lakh (750,000) PK rupees, while its actual market value at the time was 14 lakh (1.4 million) PK rupees. The former appealed against the Government of AJK’s decision and lost. The process was repeated 3 times in all and on each occasion their writ was dismissed. The Government’s decision of 23/11/99 was declared ultimate and final. No favours, empathy or further challenge was possible, declared the AJK High Court. Despite all that, the AJK Government was persuaded behind ‘closed-doors’ – now that the judiciary was unrelenting – and the AJK Government decided to change their original decision after all! In the meantime, I had managed to become a member/shareholder of the AJK Co-Operative Bank and had agitated for subsidies of bank employees for house rent and medical expenses. I also ensured 6 out of 7 cars needlessly used by the bank were auctioned off. These factors were also used against me and thus I was kept bogged down in dealing with challenges, while my genuine needs were not addressed. By 2002, I turned my energies back towards electricity generation. The State of AJK produced far more electricity than it needed via hydro power but because of the imbalanced relationship between AJK and Pakistan, AJK was increasingly suffering from electricity service cuts. I began claiming to be able to generate electricity in a manner not among the 12 methods recognised globally. I began writing to the powers-that-be in AJK and Pakistan and enquired as to how much electricity is required and where? How much they would pay for it? etc. In discussions with the AJK Government, I was directed to meet Mushtaq Ghorsi (Chief Engineer Electricity Department in AJK Government). The latter asked me to put my model on the table and then discussion would follow. Subsequently, the report that the Chief Engineer submitted to the government expressly stated that the claim of Mahmood Ahmed was against the ‘rules’ of meta-physics. That it was impossible to generate electricity without a source. When I received a written response from the AJK Government, I wrote back to clarify that my claim never mentioned creating electricity without a source. I itemised the 12 sources as listed above and explained that I could create electricity without using any of them. Further, that creating anything without source was only possible for the creator of mankind. I then challenged the bureaucrats of AJK to set a date, on which I would practically demonstrate my method of creating electricity but with one condition: That these bureaucrats would resign forthwith without receiving any compensation from the government. The AJK Government’s officials have yet to respond to that challenge and are unlikely to either. My over-riding concern is that: If I bring this model onto the table, who will prevent it from being copied? Protecting the patent would involve a very lengthy and circular engagement with the courts in AJK. Moving on to the 25th of August 2008, the next scene of major public activism was invoked by a couple of female students fainting in their classroom – for want of electricity in the heat – at Government Girls High School Kotli. In reaction, other girls at the school decided to protest on the streets against the absence of electricity. The main highway between Kotli and Rawalpindi in Pakistan was duly blocked. When I was informed of these developments, I proceeded to the scene of protest but before my arrival the local administration had managed to quell it. After confirming with various retailers in the vicinity of this protest, I began consulting the public on what to do next? It was decided – by public consensus that the 28th of August would witness a city wide strike. No shops or other businesses would open for the day and the public would march to the grid station and conduct a 2 hour symbolic sit-in there. On the eve of this intended public agitation against deprivation of electricity, agents of the State worked hard to avert – what they perceived – as this impending embarrassment. A complete strike wasn’t possible on the 28th but despite that my fellow co-citizens and I proceeded towards the grid station as originally planned. The local administration and their agents tried stopping members of the public from doing so. About 97% of the public continued their march irrespective. They were then physically stopped by the police at Abshaar Chowk (Fountain Square but without any sign of a fountain anywhere), whereupon a discussion ensued with the local administration. The latter requested a further 24 hours to resolve the matter. When that time elapsed without any progress, I decided as a political worker/activist to take the initiative to erect a protest camp at Shaheed Chowk (Martyr’s Square) in the middle of Kotli city, 3 days later. This camp remained for 33 days despite me losing my ‘Naani’ maternal grandmother (who had come to Kotli to visit our family from my birthplace across the LOC, albeit travelling over the Wagha-Attari border between India and Pakistan in divided Punjab). The protest camp remained active while I proceeded to Dadyaal to bury the remains of my deceased Naani. I was commanded by the local administration to send her remains back to Mendhar (in Indian-administered Kashmir). After stoic resistance, the administration asked me to seek written permission from the DC (Deputy Commissioner) at Mirpur. However, I felt that was un-necessary too. After all, she was a citizen of the State of Jammu & Kashmir. How could her dead body be treated as alien? My Naani was buried in Dadyaal without any such needless formalities being pursued. 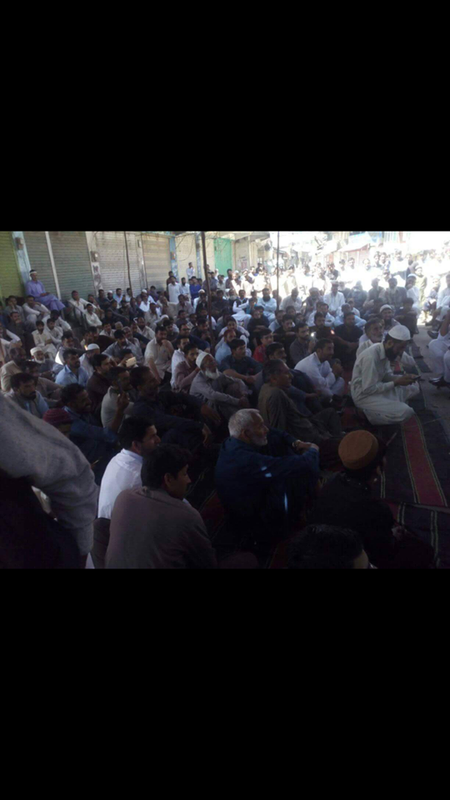 Meanwhile, the protest camp in Shaheed Chowk continued for 33 days and the discussions that ensued with the administration yet again proved that the AJK Government is either not sincere or inadequately equipped to resolve matters of public policy in AJK. In the winter of 2011, I was given the opportunity of meeting one of the ‘lent’ officers – ‘borrowed’ from Pakistan to oversee the AJK Government in Muzaffarabad. Liaqat Shah Hamdani was the incumbent Secretary of Finance and in our 54-minute long discussion, the AJK Government decision of 23/11/99 and the subsequent failed writs by the AJK Co-operative Bank were brought into the conversation. I explained that I was ultimately wronged by the very government that had made a decision in my favour. Mr. Hamdani agreed with my position and even suggested that over-ruling the AJK Government would be a matter of public interest. As I began leaving the Secretary of Finance’s office, it occurred to me that these 6 swarmy and obsequious local bureaucrats of AJK that were present in this meeting should be asked to leave, while I have a quiet word with the Pakistani lent officer. The latter agreed and ordered them to leave. I explained to Mr. Hamdani that you have been sent to such an area/region as Secretary Finance amongst a people, about whom the great sufi thinker Rumi (b.1207 AD : d. 1273 AD) is rumoured (as it is yet unverifiable according to this writer viz. Tanveer Ahmed) to have said about 750 years ago that, “If such a famine thats wipes out most of humanity were to ever occur, do not develop family ties with the following 3 types of people: 1) Afghans 2) Kumbo (a clan native to what is modern-day Punjab) and 3) Ill-conditioned Kashmiris.” I had heard this phrase for the first time from an advocate of Sehnsa who also happens to be a retired Pakistani army soldier. I can’t speak for Afghans or the Kumbo clan as to why a thinker like Rumi would utter such words but I have an idea about why such a statement was made about us. I refer you to another mystic Laal Ded (Also known as Lilla Arifa b. 1320 AD : d.1392 AD) who was born about 50 years after Rumi’s death and who was a native of the Kashmir Valley. People used to throw stones at her for appearing un-clothed in public. It is narrated that she only covered herself for one person and that was for the great Persian Sufi Sayyid Ali Hamdani (b. 1314 AD : d. 1384 AD) who has left a lasting impact on the Kashmir Valley. Whenever he would appear on the horizon, she would quickly go and conceal herself behind the thick green foliage in her immediate vicinity. Laal Ded considered others as animals and what is the purpose of covering oneself in front of animals? They have no affiliation with shame, decency or clothes. Upon hearing this harsh but possibly introspective if not questionable narrative, the lent officer from Pakistan, ushered in more tea for both of us and asked me to continue the conversation. Returning to my actual purpose of meeting Mr. Hamdani, I explained that I needed a damn loan of 7.5 lakh (750,000) PK rupees about 18 years ago. Due to devaluation of the rupee and inflation – amongst other factors – my need now is about 5 arb (5 billion) PK rupees. “What for?” the Secretary of Finance shot back. I began explaining carefully that creating electricity from thermal sources in 1993 was a totally different ball-game. I would have to re-start from scratch now. The lent officer then responded by asking me, “Are you here in Muzaffarabad for the next few days?” I responded by saying that for the sake of hope, I could remain here for the next few years if I had to. In consequence, my first public call at gras-roots level was for the 29th of May 2012, when between 12,000 to 15,000 citizens of Kotli came out onto the streets, to protest against the severe load-shedding of electricity in the region. Confirmation of such an activity can be found in any of the major Urdu newspapers available here, who all carried this event as a ‘super-lead’. 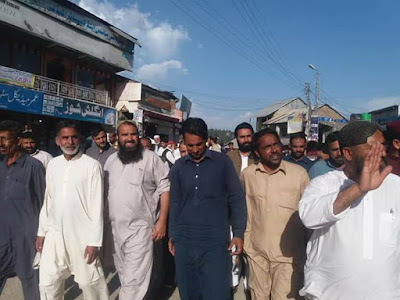 The 29th of May in Kotli witnessed scenes not unlike Srinagar at times, where a 7 hour pitch battle between the administration and the public ensued. 3 members of the public were eventually fired at by the administration and injured to quell the protest. One was Zafar (aged 48 then), who received a shot to his stomach which thankfully brushed through and exited his body. The second was Usama s/o Rafiq (aged 17 then) who was hit on his right shoulder and the bullet remains lodged in his body to this day! The third was a citizen of Tattapani who was hit on one of the fingers of his left hand. In the wake of this mayhem I decided that to prevent innocent people from being exploited for political gain (as has been tradition in J & K), that I would hold all public protests in future by myself and not engage others who may become casualties of a State, hell-bent on maintaining order – at any cost – to please their masters. Every year since that day I mourn on the 29th of May, for it could have been much worse. I also always make it a point to remind the AJK Government on the anniversary of this event, as to their responsibilities which they still remain unable to fulfill. On the first anniversary of this event viz. 29th of May 2013, the then DC Kotli – Masood ur Rehman took the initiative of arranging a meeting between me and the senior-most lent officer from Pakistan viz. the Chief Secretary, which didn’t take place on the arranged date but took place a day after. It was a congenial meeting as he treated me like a human. I made a demand for 87 crore (870 million) PK rupees of which he promised to provide 30 crore (300 million) PK rupees, from his discretionary budget allocation. This demand was related to a request for 3 crore (30 million) PK rupees for each of the 29 legislative assembly constituencies in AJK, to produce wind and mechanical power for electricity generation and should not be confused with the 5 arb (5 billion) PK rupees demanded from Secretary Finance in 2011 for producing thermal energy. 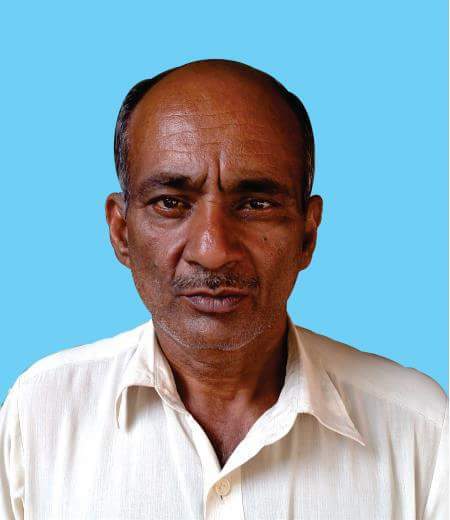 The Chief Secretary’s name was Alam Deen Bhallo and he hailed from Sindh. In his pleasant demeanour he instigated a 5 member committee to further explore my contention. This committee was to put forward its recommendations on the 28th of June. As fortune was to decree, the committee became engaged in dealing with severe cross LOC firing in the Nikyaal sector and they could not convene a meeting to decide on what to publish in the recommendations for the Chief Secretary. Thus, that promise of 30 crore (300 million) PK rupees couldn’t come to fruition either. If you recall at the beginning of this report, I mentioned an arduous journey undertook by our family in 1971 when I was just 6 years old. Well, the road that didn’t exist then was eventually built, only to be destroyed by land-sliding caused by floods in 2014. 6 months prior to the floods, I had requested the then DC Kotli Choudhary Mukhtaar on the 13th of February (2014) to take cognizance of the fact that if land-sliding occurs in this area, between 35 to 38 crore (350 to 380 million) PK rupees of infrastructure would be wasted. The water channel that is running at a height above the road surface is susceptible to destruction. Thus I suggested that he install some pipes in the water channel, in order for excess water to flow through it. The DC became angry at my suggestion and dismissed it outright. 6 months later, floods came and what I had envisaged became true. The very road that I aspired for in childhood was destroyed. Furthermore, the administration refused to reconstruct it. A local citizen Nisaar Malik (aged 33 at the time) took it upon himself to do all the necessary reconstruction. It has now been functioning for the past 4 years. He had spent about 30 lakh (3 million) PK rupees of his own money. For the citizens and administration alike using the road, they are saving over 5,000 PK rupees daily in aggregate petrol/diesel expenditure, by avoiding detours that were otherwise necessary. 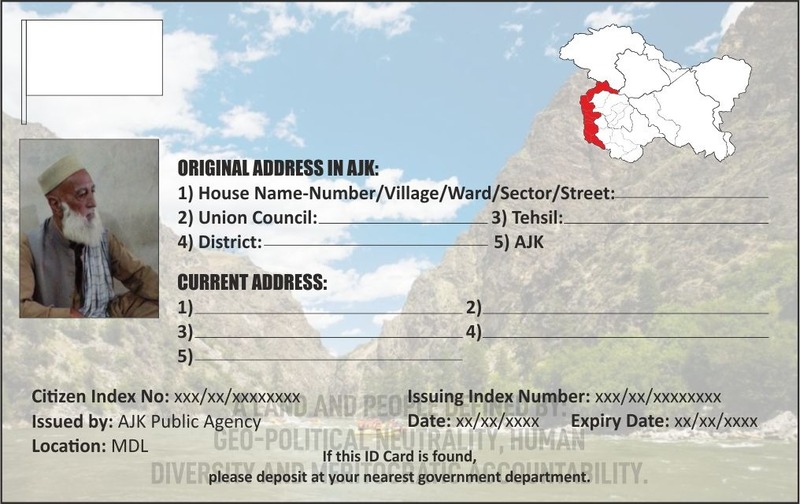 The PWD (Public Works Department) of the AJK Government had made a bogus bill of 22 lakh (2.2 million) PK rupees and digested the funds for themselves. The brother of Nisaar Malik has been enquiring about the details of these bills for the past 2 years from the concerned department but without any luck. In 2015, for my next – now – annual hunger strike camp, I took my demands in public interest back to our capital – Muzaffarabad. I erected a camp outside the old secretariat on the 28th of February. The slimy bureaucracy of AJK arrested me once again and on the next day, when the whole of Pakistan was effectively sealed due to the hanging of Mumtaz Qadri (the bodyguard who killed the then Punjab Governor Salman Taseer in 2011), the local administration had confiscated everything I had – including my shoes – and expelled me from my motherland once again, dropping me in Rawalpindi – Pakistan. Of course, I continued my protest and returned to Muzaffarabad. After 76 days, the AJK High Court made a decision in my favour, in respect of me having an inherent right to protest. However, this decision was also not implemented by the AJK administration. On the 27th of December 2016, I decided to conduct a walk from Kotli to Muzaffarabad with a list of 29 issues in public interest and 3 donkeys and a camel in tow. When I reached Kohalla (the intersection between Poonch division with Muzaffarabad division and the Pakistani border), I was prevented from proceeding further by the AJK administration. They kept me and my animals detained in the rain for 4 days. On the 5th day, a discussion was arranged between me and Raja Nisaar (Minister for Law and Electricity), with 2 members of the public present as witnesses. The minister accepted all 29 of my public demands to be genuine and worthy of attention/action. He asked for 4 to 6 months for the government to work on them. I responded by giving him a year. After which nothing happened. In light of the above, I announced in late 2017, that if my demands in public interest were not met, that I would conduct another march with 3 donkeys and a camel in tow. This time it would be from Bhimber to Muzaffarabad. After giving a month’s notice to the AJK Government, I began my 300 km march/walk from the south of AJK to its capital in the north on the 27th of February 2018. On the very next day, as I approached the district border between Bhimber and Mirpur at Jabbi with my 3 donkeys and a camel in tow, I was stopped by the local administration who insisted that Tariq Farooq (senior minister in the AJK Government and a resident of Bhimber) wanted to have a discussion with me in Bhimber city. Out of the – now – 32 demands in public interest, our discussion despite various intermittent disagreements reached consensus on the first 10 of the 32 demands. It was on the 11th demand that the minister got stuck. It related to the near absence of freedom of expression in AJK and which encompasses electronic and print media as well as academia. The minister then suggested that we adjourn for a day (this writer was present in the meeting too and minutes are available for the meeting, if the need so arises). The minister did not make contact on the next day and then on the third day, despite police restrictions, a wave of citizens from the Bhimber region forced me and my animals through the police restrictions and delivered us into Mirpur district. No shots were fired, no tear gas was employed and no sticks were used but it seemed that any of these tactics could have been employed at any stage. Credit goes to the citizens of Bhimber for calmly seeing everything through. It wasn’t until I reached Kohalla again after 38 days, that I faced my next obstruction in public interest activity. In the meantime, passing through various districts, no member of the AJK administration asked me who I was or what I was doing. When the AJK police stopped me at Kohalla, they suggested that I leave my animals in police custody at Kohalla and proceed to Muzaffarabad where a meeting with the Commissioner of Muzaffarabad Imtiaz Choudhary would be arranged for the following day. In discussion with the commissioner, it was decided that I could erect a protest camp at Kohalla and that the local police would help me decide on a suitable location. (Again, minutes are available of this meeting if the need so arises). When I returned there and a location was decided on, the police halted me once again. The rest of the day was mental torture for me. By the evening, my eyes, brain and neck stopped functioning as normal. I then fell to the ground. The police took me to Ambor hospital and on the next day when I had recovered somewhat, I asked the police to take me back to my animals at Kohalla. On our return journey towards Kohalla, the police took away my mobiles which sent an indication to me that public interest was being slaughtered yet again. I was taken onwards to Rawalpindi in Pakistan for the umpteenth time in my career, albeit on this occasion they drove me on to Kotli. The Muzaffarabad police deposited me at Kotli police station where I learned that my animals had also been transported likewise in a separate vehicle. The Kotli police had refused to accept custody of my animals from the Muzaffarabad police, who then simply just left them to stray on the streets of Kotli. I also refused to take custody of my animals and remained adamant that I should be transported – along with my animals – back to Kohalla. At this juncture, my health took a turn for the worse again, upon which I was shifted to DHQ (District Head Quarters) Hospital in Kotli. After spending 3 days there and recovering my health somewhat, I renewed my demand to be transported – along with my animals – back to Kohalla. On the 13th of April, I ventured out towards Muzaffarabad once again – this time via public transport – while my animals were being tended to by Kotli police. Upon arrival in AJK’s capital I set up a hunger strike camp, the location of which was pre-aranged by the scummy local bureaucracy there. Having said that, the public location allocated for me was not quite as prominent as I had been led to believe. A case of duplicity by the AJK Government, not for the first or last time. On the 3rd ay of this latest camp erected for public interest, heavy rain from the night before had taken its toll on my health and I was transferred to Ambor hospital once again, even though I was keen on staying at the camp. By this stage, the strain and pressure on the local administration was palpable. They of course were striving to please their masters and didn’t wince for a moment to think about how they were sacrificing public interest for the sake of their jobs. 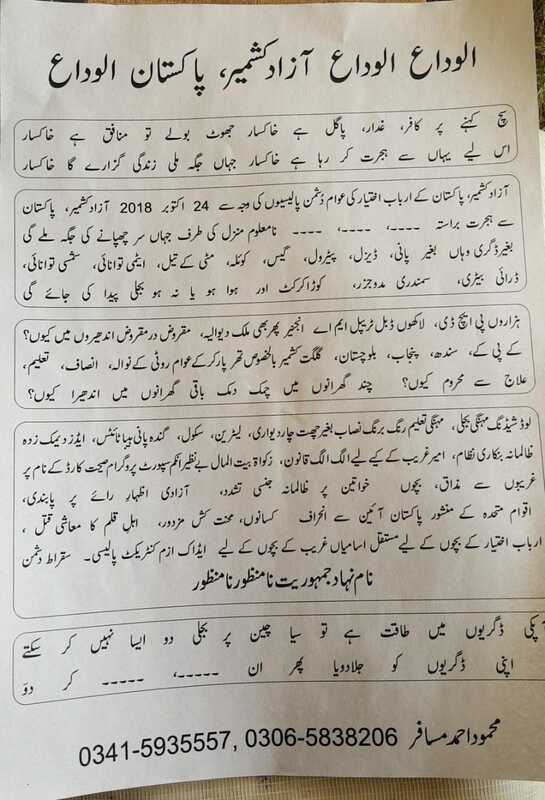 They – the local admin/bureaucracy – of Muzaffarabad were intent on expelling me from my motherland again but when they were exposed – a lot of attention was being generated on social media including the AJK diaspora, which meant that each step of the government was being monitored minutely – this left them helpless for the time being. When the AJK Government regained its senses, they began a new ploy to over-ride public interest. They announced that they were ready to form a 5 member committee to hold discussions with me. On my insistence, they assured me that there would be 2 ministers from the AJK Government, 2 lent officers from Pakistan and 1 local bureaucrat. When we arrived at the venue of discussion, there was just one old helpless looking minister of the ‘old school’, the very Raja Nisaar who had asked for 4 to 6 months last year and despite being given 1 year, had nothing to show for his assurances. The discussion took place nonetheless. 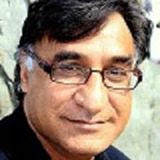 As witnesses, I had Advocate Kamran Baig (President JKNSF – Jammu Kashmir National Students Federation) and Sardar Zulfiqar (Vice Chairman AJK Press Foundation) who were local to Muzaffarabad; while Sardar Shamim of Sehnsa (and President Zardari shoe-throwing fame in the UK – 2010) and Tanveer Ahmed (this writer) were also present. 4) Who are you to raise these issues? What’s your status in society? As with the Tariq Farooq meeting on the 28th of February in Bhimber, minutes are available for this meeting too, if the need so arises. I then gave my next notice. That by the 9th of May at 11am (1100hrs), my confiscated animals and other possessions should be returned to me at Kohalla, whereupon I would proceed towards my birthplace – Mendhar across the LOC –where I might be able to peacefully spend the rest of my days. I also forewarned at this point that if this demand was not met, then I would venture out towards Pakistan’s capital Islamabad and stage a hunger strike outside Islamabad Press Club indefinitely from the 14th of May onwards. Hence, I’m still here 126 days on. In the meantime, I wrote to the powers-that-be in AJK and Pakistan on the 19th of July, that in my quest for a bright and prosperous Kashmir & Pakistan, I should be punished by either being hanged to death (allowed to commit suicide) or expelled from Pakistan too. Otherwise, on the 14th of August I shall make the decision myself. A day before this latter date, I received a letter from the National Commission for Human Rights (NCHR – Pakistan) which described that they had convened a meeting that very day and decided to write a letter to the Chief Secretary of AJK, requesting that Mahmood Ahmed Musafir be given an audience for his serious grievances. This initiative prompted me to cancel my threat (for the time being). Needless to add, there has been no response from the chief secretary to date. Just 2 days ago, on the 15th of September I held a press conference in the National Press Club – which cost me 30,000 PK rupees to conduct – whereupon consultation with other citizens of AJK and Pakistan convinced me to cancel my temptation to commit suicide and to concentrate on migrating to a country that could recognise me as a human, who wants to contribute something meaningful to society. In particular, where I could practically work on developing electricity through wind and mechanical power. Thus, I’ve given myself a deadline of the 24th of October to bid farewell to AJK and Pakistan. Meanwhile, I’ll continue my hunger strike which is into its 126th consecutive day today. Though it must be borne in mind that I am taking liquids to survive, it’s just solid food that I’m refraining from and will continue to refrain from, until I reach such a country that will acknowledge my ambition to develop alternative energy. Given the length and content of Mahmood Ahmed Musafir’s chronological description of his personal journey, I hesitate to write a summary for a variety of reasons. Not least, that this report is dedicated to the sheer determination that Mahmood possesses, despite overwhelming odds against him. I think it would be suffice to just say that I’ve known him for almost 7 years and have always found him to be absolutely forthright, strategic, fully conscious of public sentiment at all times and keen to deliver something tangible to society. It would pain him more than anybody else, if he were to migrate from his motherland Jammu & Kashmir for which he has suffered immensely on a personal level since 1984. However, given the nature of our system which is blatantly anti-human, he doesn’t want to die without having contributed something tangible for future generations. That is not foreseeable here, not in AJK or Pakistan. Woe betide that system which won’t allow a citizen to create something which it desperately needs for economic survival and prosperity viz. electricity. In many ways, he presents an accurate mirror of the society in which he’s struggled. The failings of our society in AJK and the heavily imbalanced relationship between AJK and Pakistan have been practically exposed by him like perhaps none other before him. Taking 30,000 PK rupees from a man who has virtually spent 131 days on your doorstep (viz. Islamabad Press Club) in a constant state of hunger – which he had to mentally scramble from the citizens of his hometown Kotli and for which he may still be liable to pay back by having to sell his kidney – is perhaps the most accurate description of the ugliness of society in AJK and Pakistan. Despite that, no Pakistani TV channel gave him coverage and little if any newspaper gave his press conference any oxygen. Mahmood has been based less than a kilometre from the seat of power in ‘Naya’ (new) Pakistan. Yet no representative of the new government in that country has even as much as sniffed at his public stance, which if they did could have proven to be of public utility to both political entities. We drafted and sent a response to UNHCR's reply to Mahmood Ahmed Musafir on the 14th of June. It had taken the Pakistani State 82 days to realise that there is an activist from AJK - on a hunger strike outside Islamabad Press Club - with demands that take into account the interests of Pakistan as well as those of AJK.